Some of us may think that the city we live in is incredibly boring with very few things to do – many of my own compatriots in Singapore feel this way – but the truth to it is that there are a lot of activities available around us we may enjoy participating in that we’re simply not aware of. And that’s where many social discovery apps come in, trying to help us find interesting things to do. Here’s a new one – social discovery mobile app Woofound (www.woofound.com) matches a user’s personality and recommends activities suited for them. The app uses a signature “Me or Not Me” visual game to help identify preferences and personality traits, and the app then recommends things for you to do, places to visit, or even food to try. Woofound‘s in-built personality test was developed in conjunction with a fully credited in-house psychoanalyst and psychotherapist, Noreen Honeycutt, PhD., who has more than 22 years experience and her own private practice. The service lets users create personalized itineraries for themselves or for groups of people, compile and share event details on their social networks, find fun things to do with friends based on common personality traits, and even check out who’re attending which events. It’s currently available for iOS devices and an Android version is in the works. 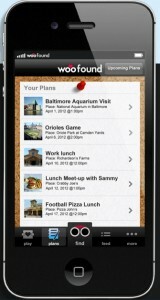 Founded in April 2011, Baltimore-based Woofound so far has raised $1,175,000 in angel investment. It currently has fifteen full-time employees.